Less than $130 per square foot. Chris Corson built this house in Knox, Maine for $208,000. That amount includes site work, the septic system, and the road to the house, but not the cost of the photovoltaic array. Image Credit: Naomi C.O. Beal G•O Logic built this house in Belfast, Maine, for about $240,000. 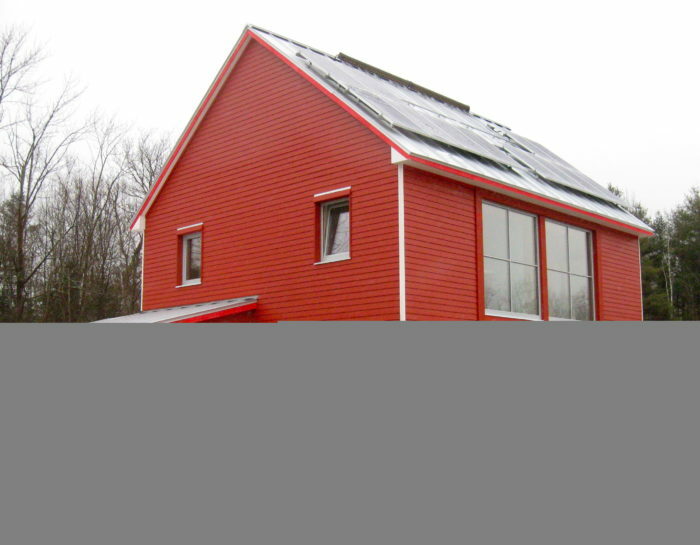 Image Credit: G•O Logic Sonya Newenhouse's Passivhaus in Viroqua, Wisconsin, cost about $167,000. That amount includes the solar hot water system, the PV system, and the accessory structures. 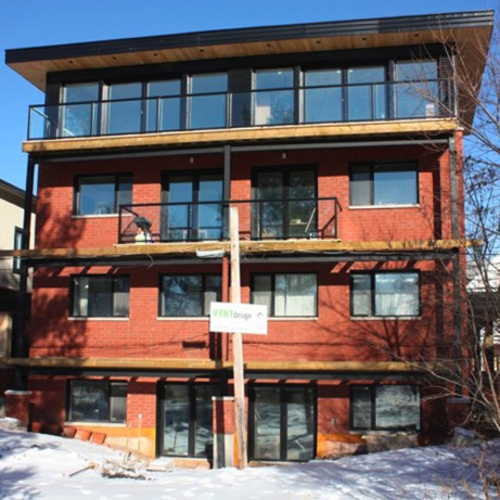 Despite all the fuss about difficulties meeting Passivhaus cost-effectively on detached housing in Ã¼ber cold climates, there have been several projects recently that seemingly disprove the fussers. Now, that’s not to say that meeting the Passivhaus standard in certain localities is a walk in the park – it’s certainly difficult in many places, like Siberia; the north slope of a steep, east-west valley (GraubÃ¼nden! ); Fairbanks… That being said, there are projects (certified, even) that meet the Passivhaus standard in climates north of 7,000 heating degree days (HDDs) – and with the advent of something like Super Windows – well, much of that nonsense could become completely moot. The first project is the house that Chris Corson (the owner of EcoCor Design/Build) recently wrapped up in Knox, Maine. The project has seen some good press (including a GBA story) and great praise recently – I ran into many people at the recent Passivhaus conference in Hannover, Germany, discussing it, including some Canadians and Germans. The 1,600-square-foot two-bedroom house sports a treated floor area of 1,140 square feet (106 m²), which some would say falls under the “small” category. It also happens to be a detached home in a really cold climate (modeled at 7,345 HDDs). Chris was able to bring the cost of construction to under $130/sf. The modeling bests the specific space heating demand, coming in at 3.11 kBTU/ft²a (9.82 kWh/m²a). This was done through a combination of superinsulation, phenomenal windows (from Intus) and a phenomenally low blower door test of 0.286 ach50. The most impressive bit about getting the space heating demand so low, outside of achieving affordability in a difficult climate, was leaving wiggle room for future additions or modifications. Furthermore, cost savings may have been realized by dialing back the insulation closer to 4.75 kBtu/ft²a. 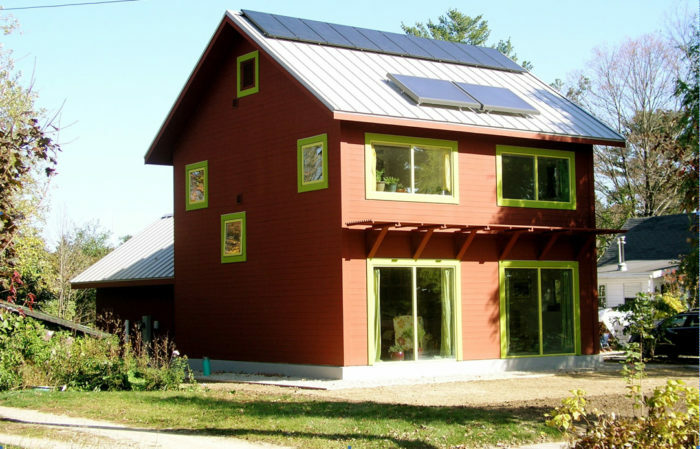 The second project is G•O Logic’s 1,500-square-foot, three-bedroom Passivhaus in Belfast, Maine – just down the road from the project above (by the way… WTF is up with Maine?!?). This one also garnered lots of press, and recently snagged a LEED for Homes Project of the Year award. Yup, they were able to garner PH and LEED Platinum certifications for ~$160/sf. You can read up more on the project at Maine Home + Design. 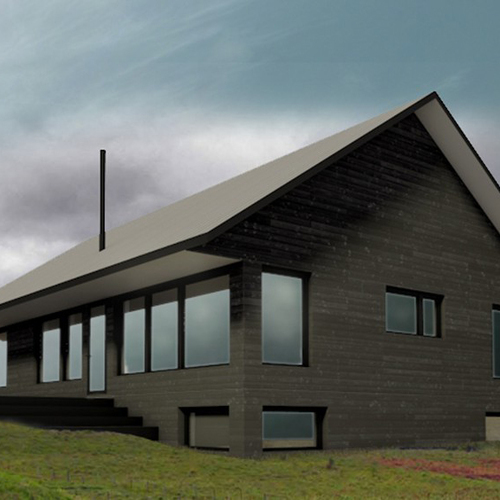 The third project throwing a wrench in the ever-weakening argument is the Ã¼ber-compact NewenHouse in Viroqua, Wisconsin (7,795 HDDs), with Carly Coulson as the certified Passive House designer. This tiny (968-square-foot) kit house has a treated floor area of 888 square feet (82.5 m²). This project sports local windows and Cardinal triple-pane glass, while the doors are Energate. 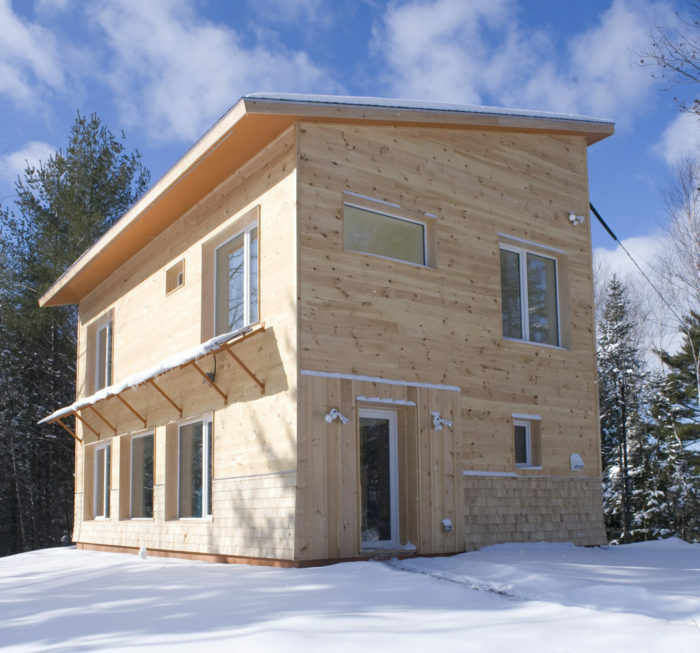 Like the Knox, Maine, Passivhaus, the NewenHouse is wrapped in a jacket of cellulose – and similarly comes in well under the specific space heating demand. The project went through BRE in Watford, UK, for Passivhaus certification, is Energy Star certified, and is expected to hit LEED for Homes Platinum. Total cost for NewenHouse – including solar DHW, PV, and accessory structures – is a whopping $173/sf. If there was a LEED Titanium, this Ã¼ber-tiny Passivhaus in an “extreme” environment would surely qualify. While these may not be the modernist jewels we tend to drool over – these are sound, extremely cost-effective houses and further proof that there is more of a bad design/shoehorning penalty in extremely cold climates – rather than a detached housing one. And if locally made PH windows and glass ever become available, that cost-effectiveness will only improve. If you haven’t yet signed the petition to protect the Passivhaus standard in North America, then mosey on down and drop your digital signature. 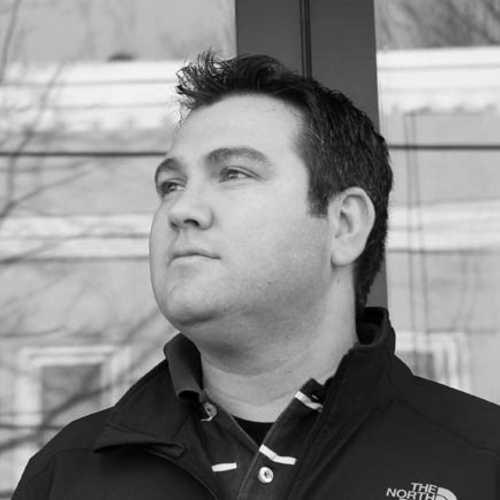 Mike Eliason is a designer at Brute Force Collaborative in Seattle, Washington. I would gather the Mainers are able to reap materials savings because of the state's thriving lumber and plywood industry. I'm sure they "bought local", at an advantage over other regions of the U.S. where materials are more costly. I am friends with the various parties - Chris Corson, and Alan GIbson and Matthew O'Malia at GO Logic. They have all been working hard on this problem (high performance, low cost) for many years, and they deserve all the good attention they've been getting. Chris also just had a great piece in JLC on his house that I would encourage people to look at. Interestingly, the part of Maine they all live in has no building code (or didn't until very recently). I don't know how much of a factor that is, but certainly the mid-coast area has a decades-long tradition of experimentation with energy efficiency and green building techniques. The DIY spirit, perhaps a legacy of the Nearings and many others, is also pretty strong here. And of course it's cold, which is a strong motivator. They can weigh in, but I'm pretty sure those were selling costs. I don't know many builders who advertise their internal costs. The costs are the builders cost of construction less land, landscape, drive, well, septic, sidewalk, and finally project mark up? If so, the selling price might be double, no? Anyway, great posting, the info and success is great to hear. Edit: just opened the pics and found cost details (most of construction, less land and landscaping completion). The selling costs are very good indeed. Shane- As far as i know, and there are others on this site more qualified to speak about this, There are no plywood manufacturing facilities in Maine. 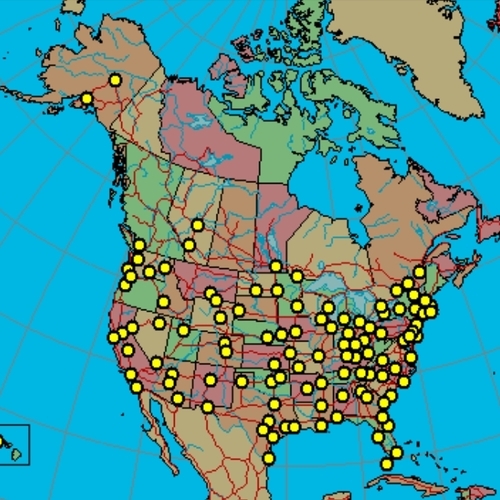 I think that the bulk of the plywood/ OSB manufacturing is in the SE and NW US. We use KD spruce for framing which is imported from Quebec mostly. Regardless of that, we pay " fair market prices" for ALL of our engineered lumber. I use OSB not ply. I use lots of engineered lumber. A 9.5 in LVL costs me 4.78$ LF. OSB is 10 bucks a sheet. 2 x 4 x 8 KD is 2.30 something. Ice and Water 135$ for 220ft2. Bla ,bla, bla. I do like to use unfinished, untreated eastern white pine whenever possible. It is VERY local, VERY responsibly farmed and it looks great..to me. I buy local when I can. I dont cheat. My only advantage is.......well.........i wont tell you, its something. This is a quote by Peter Bruckman from 1927 that I have taken from Mike Eliason's, most recent BFC blog post. It speaks volumes. As far as building codes go..... It is true that some municipalities up here do not have permitting let alone inspections, most do. I am building a PH right now in a town that has literally NO codes. That being said, I do have codes that we comply with they are not local but rather international. Everything we have or will do (Design or construction) complies with IRC 09, and has been vetted by Engineers ( we have those in Maine too). I will be the first one in line if they adopt contractor licensure in Maine. They should. AJ- Costs were relative to that particular site and project.It was value engineered from the start. My intent was to use this house as an example of what is possible and replicable. Differing markets will vary, and I lived very close to the bone on this one. What is possible......win. Replicable................TBD. The 208.637.00 included site work and septic for three bed. Driveway and the house. It did not include the PV. There was very little profit, that was my choice. I took a look at the superwindows website this article linked to. The window rating I saw there was a U=0.31 unless I misunderstood the chart at http://superwindows.eu/en/superwindows/invis160-stack/prototypy/. So what is so radical about a U=0.31 window? I just had double pane windows from Inline Fiberglass of Canada installed in my passive solar house up in Hyde Park, VT that have U values equal to or less than that. In fact they have some that go all the way down to 0.13. What I liked about the Canadian manufactured windows is that they use a rating system that combines both U and SHGC to give you an overall rating of the net energy gain of the window, which for a house with a passive solar heating component as part of its design is helpful. I'm also confused about the R values cited. If I understand correctly R values are the inverse of U (see http://en.wikipedia.org/wiki/R-value_%28insulation%29#U-value) . So how does a U=0.09 translate into an R-63. Likewise for the other listed U values. But assuming the R-values are correct and there is either something I'm not understanding or a typo of some sort how does one achieve that type of insulation levels as a practical matter? My house has mostly R-53 roof comprised of 14in SIPs, except in a few places where it is only R-49 with 12in SIPs. My walls have R-26 6in SIPs but I'm adding another 2in of polyiso on the inside to bring it up to R-39.5. At present I've completed the weather tight shell and am working (albeit slowly) on the interior build out. My cost so far is just under $89/sf and I'm pretty sure I can bring the project in at or below $115/sf when all is said & done. So I don't doubt that you can build very energy efficient at $130/sf or less or that you can get R values 50-100% higher than those I got at that cost. I am definitely interested in the construction techniques used to do so because I considered lots of different ways to try to get better insulation levels. Mostly what I seemed to find was that while it is technically possible to do so, the extra cost involved didn't seem to be offset by the energy saved. In other words energy cost savings achieved by the first $100 to $110/sf had a payback I would live to see but after a certain point the upfront costs for each $ of energy costs saved went up in a non-linear way. BTW Does this site have a place for posting photos and info on projects? I got so much help from the folks here and I thought some of those who helped out might be interested in seeing what the results are.. The superwindows U-values, and the U-values I posted are in metric. The readers of my blog (and GBA as well) hail from all over the EU and North America, so I try to cater the stats to both. And those guys presented a version they think they can get down to U=0,1 W/m2k (metric) which corresponds to an I-P U=0.018 BTU/hr.ft2.°F or R-56. Still in early phases - but phenomenal outside-the-box thinking we could use more of. In terms of practicality of achieving those levels of insulation - cellulose ain't expensive. Paired with the TJI walls (oriented vertically) allows for fairly effective installation. I'll let Chris speak in terms of payback, I'm not overly familiar with the rates and rebates in that neck of the woods. I do know that here in Seattle, our electrical rates are absurdly low, but recently heard we'll be seeing ~5% increases/year for the next few years to pay off infrastructure improvements. That will certainly bring down the payback time for us. No building code/energy code is completely foreign to me. I've been uber impressed with the goings-on in the northeast. Chris - I referred to lack of code not to suggest you were cutting corners but more that it might have contributed to the history of creativity in the mid-coast region. And also of course that it's interesting, ironic, etc. @ Dan.................Man, no offence taken what so ever. You are right though. There are a lack of codes up here and even where they are implemented the CEO's are less than knowledgeable in some cases. Like not knowing what AAV's are and how they work,( which my plumber is scared of too BTW). That being said, That situation has allowed for forward thinking in regards to methodologies. It has also resulted in what i consider to be blatantly stupid and irresponsible, if not dangerous practices. I was just making the point that I and EcoCor Design Build LLC, are on the forward thinking side of things rooted in building science, and abiding by all local and international laws. Not on the side of things where dormers are slapped up against a 10/12 without sureing up the ridge. 100 YO 2x 8 ridge 'beams' no likey dormers, unless you are going for the sagging ridge neo-Goudi meets Midcoast Maine look. Throw up some mosaics on the roof instead of asphalt and BALI! 1930 Barcelona. You are right. It is very interesting, and I actually have never thought about it in those terms, maybe that is because I am from 'away'. Food for thought. Mainers are an industrious,creative and resourceful lot. It is one the endearing things to me about this place. Carving a life out of the woods..........its romantic, actually. @ Mr. Eliason.........You came up with the Bruckman thing. I just copied it and used it in the interest of perpetuating a great thought. As far as the EWP and vertical orientation goes, yes. I actually thought about orienting it vertically. But there were three factors influencing my decision....1- i felt like the north side of the house with the super tall back side of the mono truss was going to get a little out of scale with vertical siding, I thought the horizontal shiplap would help "ground" the structure. The cedar shake water table was meant to do the same thing. It also allowed me to add some vertical board and batt to establish a more formal and defined front entry surround as well as add some texture to the facade. #2 It was less expensive from a labor standpoint to simply use the vertical rainscreen as the nailbase for the siding v. installing another layer of strapping to maintain a continuous drainge/convection plane. #3 Our clients were chomping at the bit to get into the house, I mean chomping. So this was faster as well. Back to the code thing, I moved to Maine from Florida where we had not only licensed contractors, but 26 inspections or so. None of which took any interest in the IECC. No building codes is foreign to me too. Maine does have a little bit of the wild west in its soul. That is endearing too. As long as no one gets shot. @ Jay - To me there is a broader perspective on what ROI is. There is more than simply a fiscal ROI. There are also emotional. intellectual, educational, and even possibly spiritual returns on ANY (even monetary) investment. Without getting too esoteric I will leave it at that for now. Like a friend/client of mine said "grab your rubber ducky"
PH is the first quantifiable metric based system that perpetuates 90% reductions in the energy consumption of the built environment. These are the changes we need.They are the alpha, not the omega. 2030 is NOW! Last week NOAA announced that CO2 had reached 400ppm in the Arctic. Bad for Manhattan and for polar bears. How? How are we going to make these changes. Some might say by any means necessary. I......not being a fundamentalist fanatic, but instead a reasonable person, propose we try to achieve these Metrics and push these limits, in the most reasonable and responsible way possible. To me that means doing as much as possible to build with materials that are not part of the problem. Building a house that does not run on fossil fuels, but is fabricated by components that are made out of fossil fuels does not make sense to me. Healthy, comfortable, efficient homes that reduce the carbon footprint of the building to near zero using local, and "clean" materials makes sense to me. if you check out the JLC May article it begins to outline how I did this. With any luck and maybe the grace of GOD, what I am doing will be outdated in two years, what I was doing four years ago is. Your reply to Jay, above, is moving, succinct, and balanced. I've just clipped it to my desktop to spread around these parts. (I'll send royalties when they pay me for the wisdom.) Thanks. I would like to ask Mike how he established the imperial U-values from the metric? I have been looking for an accurate way to do this for some time. If the metric values are calculated using CEN they are not easily converted to the imperial NFRC values since both use different temperature ranges to calculate the U-values. I would greatly appreciate a formula that will convert and still take in the difference in ranges. Bronwyn Barry prepared a presentation which talks about the PHI U-values (metric) compared to NFRC. There is a slight difference in the final window U-value due to the differing protocols. I'm drawing a blank on whether PHI follows a DIN standard for testing, I'd assume they do. I will take a look at the article as soon as I get time. I think that some of the PH members are trying to develop an actual PH protocol. I will have to follow up on that. I want to mention that I represent a California company that manufactures a German certified PH window. The window is the Geneo series. The series includes tilt-turn, hopper and fixed. Very high water and air performance along with the energy rating. Also very reasonably priced compared to the European imports and fiberglass. Short lead times. Info can be found at http://www.westcoastvinylwindows.com and http://www.premierwindowgroup.com. "unfinished, untreated eastern white pine"
Tell us a little more about the siding. Is it T&G or beveled? Back-vented? Gapped? You just think it will turn silver and not crack, split or rot? Fasteners? Cost? Kevin- It is Shiplap eastern White Pine. It is secured on a 5/8" continuous rainscreen, ie 'back vented'. It will shrink a bit ideally creating nice shadow lines and texture.Yes I expect it to silver out and grey. That is actually the look we were trying to achieve. I spec'ed and used stainless fasteners. 2-3/8 ring shank stainless(bostich). The cost of the siding was actually more expensive than say cedar shakes, but labor was less. I have still not yet crunched all of the numbers but I am plugging away at it slowly. Erik I am doing that very thing right now. A PH in a rural area with tons of southern shading (summer- deciduous) and moderately exposed on the east, west, and northern facades. Lots of glazing and natural light. One door and six large-ish windows on the north. 2400 ft2 gross.We have designed a house for Portland Me. that I believe can be heated with ventilation air ( PEAK -and I hope we get to build it). I am working on it man. Samual Clemons said "wright about what you know" same goes for design, there are smart dudes like yourself in urban areas, you'll figure it out. I am thinking about that too , but there are a lot of people in NYC living it, tap them they are good folks. Solar Access is a luxury, not a necessity, be creative,design.